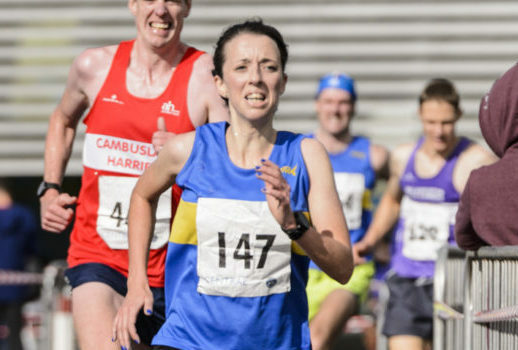 The National Road Relays 2019 saw mixed fortunes for the club at the final event of the winter season which was held at Livingston this year. The ladies again showed the way with a superb silver medal. This follows on from the silver at the National Cross Country Championships and an excellent season over all our women this Cross Country Season. The team of Kathryn Pennel, Avril Mason, Jennifer Martin and Fionnula Ross combined well to finish a close second to Central AC. Both Avril and Fionnula having the two of the fastest long legs. The M50 Team which contained men who had been in the winning team at this event many years ago, again they delivered with a silver medal in their age group. Bill Breckenridge,Brian Scally, Denis Williams and Walter Henderson placed 2nd to Cumbernauld AC. It was a great turn out from the club and a successful day. Last weekend Michael Deason made the trip to Cyprus where he finished 2nd in the Logicom 1/2 Marathon in a time of 71.52. As we finish another winter it is important to thank all our team mangers and officials for the great effort they put in on behalf of the athletes – The Track and Hill Running Season is now about to start !